Most of us have heard the term “BMI”, but how many of us really know what it means? And do we fully appreciate how important it is for our health to know this number? At London Doctors Clinic, our GP’s regularly calculate patients’ BMI’s, in order to assess whether they might be under or overweight. But you don’t need to be a doctor to work this out and interpret the results, as we explain in today’s blog! ‘BMI‘ stands for Body Mass Index. It is the number that relates your weight to your height, and gives you a general indication if your weight falls within a healthy range. Your BMI is calculated by dividing your weight in kilograms by your height in metres. Sounds complicated, right? Well, it’s not really! There are many online tools that can easily calculate your BMI for you, and even convert your weight from stones and pounds to kilograms, so there’s really no excuse for not knowing this vital number! All you need is an accurate measurement of your height and your current weight. Log onto an Online BMI Calculator Tool with these numbers to hand, and you can easily fill them into the tool to find out your own number. Why Is Your BMI So Important? While awareness of the dangers of being overweight is increasing, so too is obesity. This is largely due to modern lifestyle choices. The rising rates of obesity (as well as costing the economy billions of pounds a year) are resulting in higher than ever rates of obesity related complications, such as Type 2 Diabetes, Heart Disease, Stroke and mental health issues such as Depression. Therefore, we each have a responsibility, to ourselves and those around us, to maintain a healthy weight. Whether you are simply looking to inform yourself, maintain your current healthy weight, or actively seeking to lose some of those extra pounds, knowing your BMI is a great place to start! 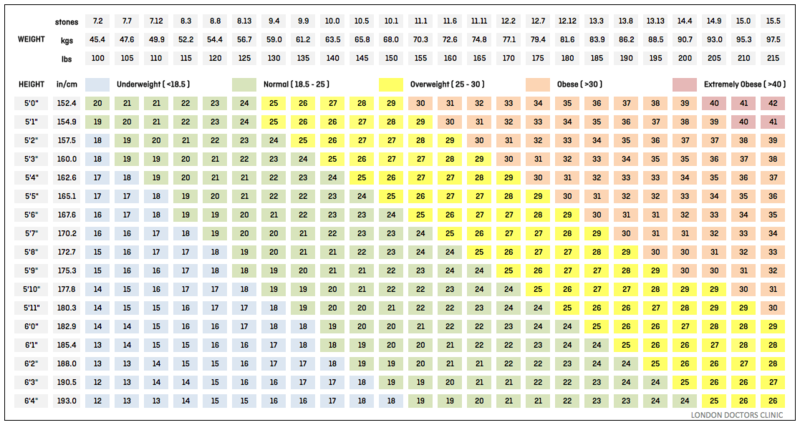 We can tell from this table that the higher your BMI, the more likely you are to become ill because of your weight. But it is also useful for the opposite reason – if you are a person who is underweight, for example, you may also be at risk of certain disorders, such as malnutrition related problems. To make this concept easier to understand, let’s use examples. If a woman is 5ft 4 inches (1.52 metres), and weighs 9 stone 4 pounds (59 kg’s), then using this BMI calculator her BMI would be 22.2, which is normal. However, if the same woman weighed 11 stone 4 pounds, then her BMI would be 27.1, which would place her in the overweight category, and the advice given to her by her GP would likely be to make some simple changes to her lifestyle which could help her to drop the extra pounds. Along with knowing your BMI, it is also very helpful to know your waist circumference. You can find this out by measuring your waist using a measuring tape. To do this properly, you need to wrap the measuring tape around the area just above your belly button, and below your rib cage, and avoid sucking in your tummy, tempting though it may be! Your waist measurement is especially important, as central obesity (fat that accumulates specifically around the abdomen) is considered to put you at extra risk of illness, such as cardiovascular (heart) disease. If you think your BMI may be too high, you can easily find out if it is! One of the ways you can do this is by visiting your GP, who can measure your height and weight in the clinic, and will then enter these numbers into a BMI calculator, and give you your individual number. For more information on BMI, weight management, or the many medical conditions associated with being overweight, booking in for a 15-minute GP consultation at one of our private clinics is a great next step! Our doctors can measure your weight and height in the clinic, calculate your BMI, and provide any relevant advice and guidance regarding important lifestyle changes that may be recommended.